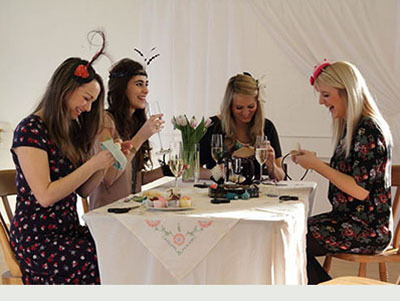 Join us for our spring fascinator workshop. Come and create your very own headpiece to dazzle your friends and family with at all your summer parties and events. If there are any specific colours/ styles/ themes you would like to make or if you want a fascinator to match an outfit, just let us know in advance. After a fun 2 and a 1/2 hour workshop (with a glass of bubbly and tasty refreshments), you will leave with a beautiful fascinator made by your own fair hands! There are many different styles for all abilities, so do come along whether you’re a novice or experienced crafter. The workshop will be led by professional milliner and fashion accessory designer Bee Smith.